Our organization is among the most sought after organizations which manufactures, supplies, trades and distributes to the clients Marble Gas Stove. There is exclusive range of these Marble Gas Stoves which are at par with the set industry parameters. Moreover, these are free from the defects. We are amongst the most prominent enterprise actively engaged in manufacturing, distributing, wholesaling, trading, retailing, and supplying a comprehensive array of Gas Stove Two Burner Automatic with Glass. This has reliable in its operation and give excellent performance, our offered range of gas stove is broadly valued for their quality. The gas stove offered by us is also verified on several testing parameters in compliance with quality standards. This gas stove is easy to clean & highly durable in nature. Being a renowned organization of the market, we are engaged in manufacturing, distributing, wholesaling, trading, retailing, and supplying an exclusive range of Gas Stove Three Burner Automatic with Glass. Our offered gas stove is checked by quality experts before the delivery to our customers. This gas stove is designed from the marble & other allied material under the strict supervision of our adroit professionals. Along with that, our offered gas stove can be availed from us at reasonable rates. By keeping track of current market developments, we bring forth a wide array of Gas Stove Burner . Using the best quality marble & other allied material and advance technology, the offered gas stove is designed in compliance with the quality norms. This gas stove is provided in variegated sizes, designs, our offered range of gas stove is easily availed to our customers at affordable rates. 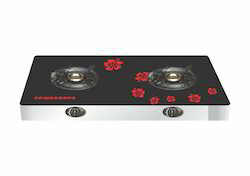 Glass Top Three Burner offered by our organization has created niche in the industry. 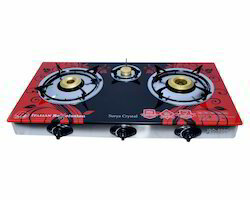 Ability to give reliable and excellent performance for long period of time makes these Glass Top Three Burners quite unique and superior to the similar range of these Glass Top Three Burners available in the market. The quality controllers hired by us have thoroughly examined entire range of these Glass Top Burners before making them available in the market. Owing to our highly-advanced manufacturing unit, we have been able to provide a comprehensive range of Gas Stove. In conformity with the quality standards, this gas stove is designed using high grade marble with other related material and modern technologies. The gas stove offered by us is also checked under the direction of our quality controllers to assure flawlessness. Our offered range of gas stove can be customized in various options to fetch maximum satisfactions for our honored customers.